Colony House is a brick Georgian residence on 2 acres in a quiet suburb of Boston. The existing conditions on the site consisted of a steep slope that set up a sharp disconnect between the main house, the lawns and the carriage house in the rear. By creating a procession of experiences, the design connects the interior with the exterior and creates a flow between the outdoor spaces at different levels. 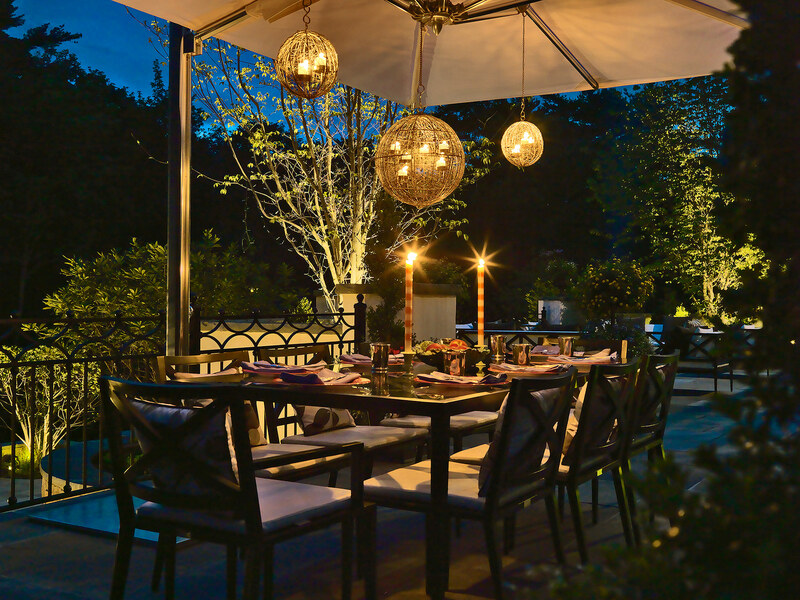 The upper terrace was redesigned to create three distinct exterior ‘rooms’, furnished with both a formal and casual sitting area, and a large family dining space. New plant beds, fountains and large planted pots frame the three spaces, adding color and reflecting the elegance of the interior décor. The new lower terrace is sited at the level of the existing carriage house and contains a new pool, spa, waterfall and fireplace. The fireplace is positioned so its reflection in the pool echoes the reflected light from the carriage house into the spa. This level serves as the mezzanine for viewing the games and lawn activities thirty inches below. A single block of granite is set into the retaining wall between the main level of the house and the pool level. 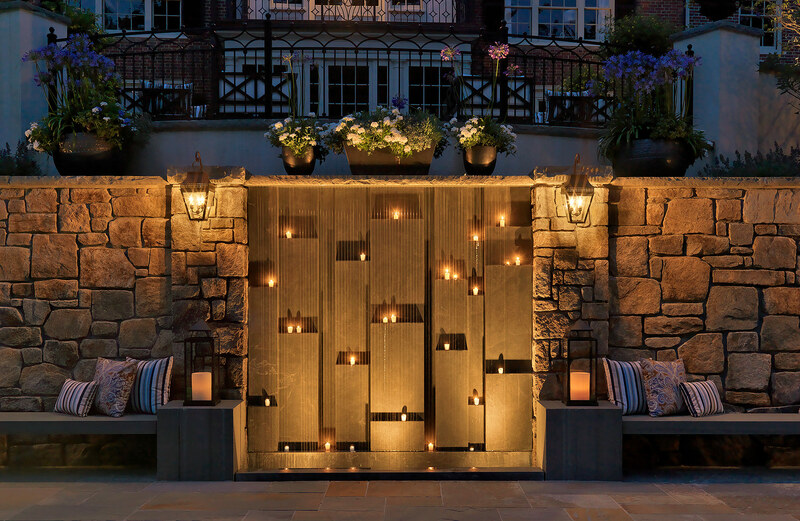 As the backdrop for a waterfall and the focal point of the pool area, it represents the bedrock walls in the regional deep-pit quarries that provided the original stone for the house foundations. The granite’s vertical lines draw the eye up to the house, visually connecting the different planes. The carvings in the bluestone block benches on either side of the waterfall symbolize the traditional plug and feather method of hand splitting in the local boulder quarries. The stone used in the flanking walls was chosen to match the stonework at the front of the house. The project also includes a new connection from the pool terrace under the dining terrace and into the exercise and family room area at the basement level of the house. Custom handrails and gates echo the leaded glass windows at the front door. The design scope included all outdoor furnishings, lighting, and assistance with the new pool house space-planning and furnishings. 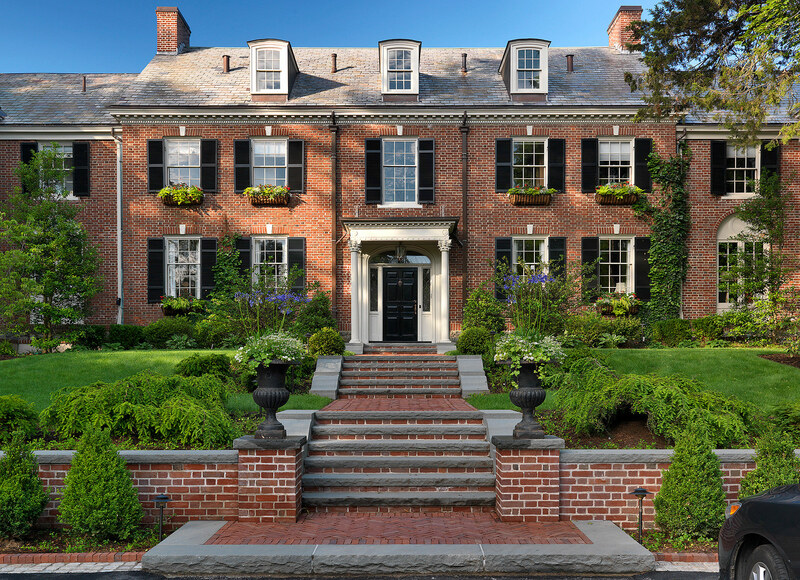 The front of the house was developed as a separate phase which included parking, a brick retaining wall, new steps and path to the front door, lighting, planting and a snow-melt system under the driveway.